The final day and another exceptionally early start. And again in two legs, but this time I had the company of my wife for the first part down into Ruthin. Leg 1 : Clawdnewydd to Ruthin. 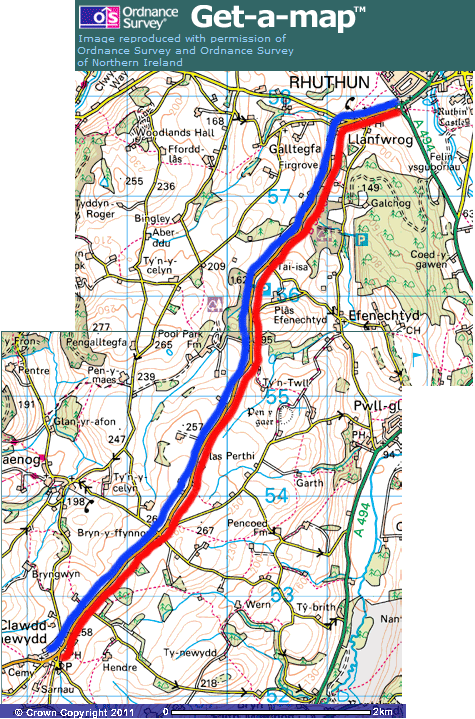 Leg 2 : Ruthin to Clawdnewydd. Total : 10.0 miles (don't ask me why it doesn't add up! Exactly as forecasted, the rain stopped at 6.30 am sharp; then as the sun rose so did the skies clear. Soaking grass verges meant my boots were soon wet through. Keri however quickly picked up the Lucozade trail and I was soon snapping away. Almost the entire B5105 is pavement free and it is one very pedestrian unfriendly road. But some of the stretches this morning with their steep high banks, no verge at all and right hand bends were treacherous. Couple that with most motorists conviction that you only need give pedestrians an inch, and it is a pleasant surprise to me that I am alive to write this now. The walk to Ruthin took 2 hrs dead. Banana nineses and a gulp of our own Lucozade - which I resisted throwing into the hedge. Then Keri drove home while I started the uphill slog back to the car. 1 x sunny spring morning. 1 x caught short nip into the trees at Pool Parc. 1 x near miss with a white pickup. 1 x finish post at Clawddnewydd. 1 x resolve never to do this ever again. 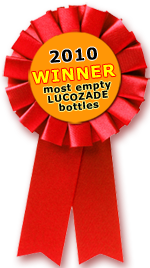 113 x Lucozade bottles found. Got a corpse to dispose of or just an old sofa? Why not drop in to the Clocaenog - at any entrance just off the B5105 - and it'll be 30 years before anyone finds your late loved one..
Meet at a different layby each week to discuss all matters pertaining to tarmac and lucozade bottles. If you want to join us, or otherwise just receive our refreshingly vapid newsletter, sign up here. If nothing happens, keep clicking. 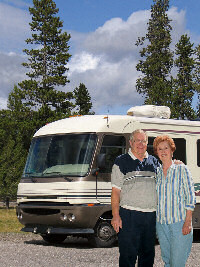 Fred and Marlene Winnebago (pictured above) enjoyed 4 star luxury during their visit to the B5105 last August. King size beds, lounge, kitchen, hot and cold running water, bathroom complete with shower and wc. Satellite TV and 3½ miles to the gallon in the enormous motor home they brought with them. Plenty of signs like this on the B5105.